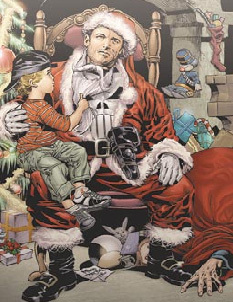 He knows if you've been bad or good, so be good for goodness sake! A mostly American subgenre—special television shows, often one-shots, created with a winter or holiday theme for broadcast during the month of December. Most prominently feature Santa Claus and his associated mythology, as they try to preserve political correctness. Some try to elucidate us on the True Meaning of Christmas. Perhaps the best-known Christmas Specials are the animated ones (including the stop-motion animations produced primarily by Rankin/Bass) from the 1960s through the 1970s that rerun annually. Far more numerous, though, are the various celebrity specials, which usually take the form of a low-key holiday-themed Variety Show. Usually the latter are rather forgettable by virtue of their one-off nature, but sometimes they can generate moments that survive decades. A case in point would be the Bing Crosby-David Bowie duet of "The Little Drummer Boy", which has taken on a life of its own above and beyond the 1977 Crosby special from which it sprang. Compare Christmas Episode (generally known as Christmas Specials in the UK) and Halloween Special. If the holiday celebrated in the special only looks like Christmas but is renamed to match the setting, it's a You Mean "Xmas". Disney put out From All of Us to All of You on its weekly show in 1958 - some new cartoon footage linking excerpts from their classic animated films and old shorts, and preview clips from their new features. After a few decades it faded away from American tv, but continues to be a very big draw in the UK and Scandinavia. Mr. Magoo's Christmas Carol (1962) was the first animated one of these to be produced expressly for television. Rudolph the Red-Nosed Reindeer: The Movie (1998). It's mostly unrelated though. There are actually four Peanuts Christmas specials. Obviously, A Charlie Brown Christmas easily overshadows the other three, which consist of It's Christmastime Again, Charlie Brown (1992), Charlie Brown's Christmas Tales (2002), and I Want a Dog for Christmas, Charlie Brown (2003). Charlie Brown's Christmas Tales was created specifically to pad out an hour timeslot for A Charlie Brown Christmas so that it wouldn't have to be Edited for Syndication. In France, Le Père Noël est une ordure (1982) is broadcast virtually every single year on one of the six main channels around Christmas. It's actually a very dark comedy one of whose characters works as a Mall Santa. The Barney franchise has four Christmas specials: Waiting for Santa (1990), Barney's Night Before Christmas (1999), Barney's Christmas Star (2002), and A Very Merry Christmas (2011). A Wish for Wings That Work (1991) -- The only animated Bloom County production, to boot. Franklin: Franklin's Magic Christmas (2001). The True Meaning of Christmas Specials (2002) with David Foley of Kids in The Hall (and News Radio) fame. Doctor Steel's Dr. Steel Christmas Special (2007) and A Dr. Steel Christmas (2009). Red vs. Blue often does holiday specials; in 2009, they made a 3-part special for Christmas. Strawberry Shortcake has two: Berry Merry Christmas (2003 continuity) and The Glimmerberry Ball Movie (2009 continuity). Kung Fu Panda Holiday Special (2010). Given the setting is ancient China, the producers use the Winter Festival instead for the occasion, which also makes the special applicable from American Thanksgiving to New Years in the future. Charlie and Lola had an episode with the siblings visiting the elves and saving Christmas. The Venture Brothers "A Very Venture Christmas" - introduced the Krampus to much of America. The Adventures Of The League of STEAM episode, "The Fright Before Christmas". This page was last edited on 23 January 2018, at 19:42.